On Saturday, May 28th, 2016 (Spring Bank Holiday), Bermudian Culture and Heritage will take centre stage in Liverpool’s creative and digital heartbeat, the Baltic Triangle at Constellations. 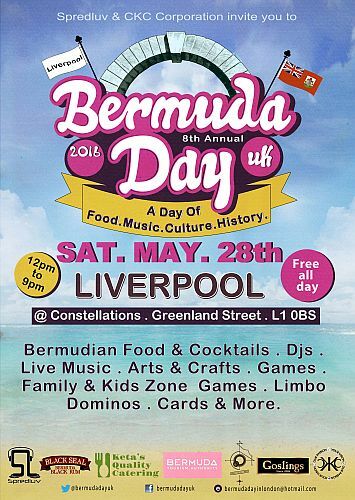 The 2nd Annual Bermuda Day UK – Liverpool Family Event will feature Live Performances by Bermudian Artists, Kids and Family’ Zone, Arts & Crafts, Limbo, dance performances, Bermudian cuisine and drinks, vendors, Bermuda-themed Trivia & Games for all, and many more highlights. This year we warmly welcome Keta’s Quality Catering as featured Bermudian food vendor at the event! Although very little is known about Bermuda, apart from its picturesque beaches, stunning sunsets and the legendary “Bermuda Triangle”, Bermuda Day in the UK, a free family-friendly event, aims to celebrate and promote Bermudian culture, heritage and history through music, cuisine, and more. The event is a beautiful advert for Bermuda and her talents, and continues to be a great outing for UK residents and Bermudians living in the UK. Visit www.gotobermuda.com and discover so much more.